Formulated with UK sourced chicken meal and fat. Contains omega 3 and 6 essential fatty acids and zinc for a healthy skin and coat. Contains high levels of chicken and rice for optimum palatability and small firm stools. Beet pulp a good source of soluble and insoluble dietary fibre important for maintaining normal intestinal transit time and motility. A full compliment of vitamins and minerals to help maintain a healthy immune system. Yucca schidigera extract to help reduce faecal odour. No wheat, wheat gluten, beef, pork, dairy or soya. Crunchy kibbles for oral health. Our RSPCA dog food is a super premium, complete food for adult dogs of all sizes and from age 12 months to 7 years. See below for full details and ingredients. Healthy digestion: Contains prebiotics which may help to promote the growth of healthy gut bacteria and thus aid digestion. Also contains sugar beet pulp, which is a good source of soluble and insoluble dietary fibre, which is important for maintaining normal intestinal transit time. 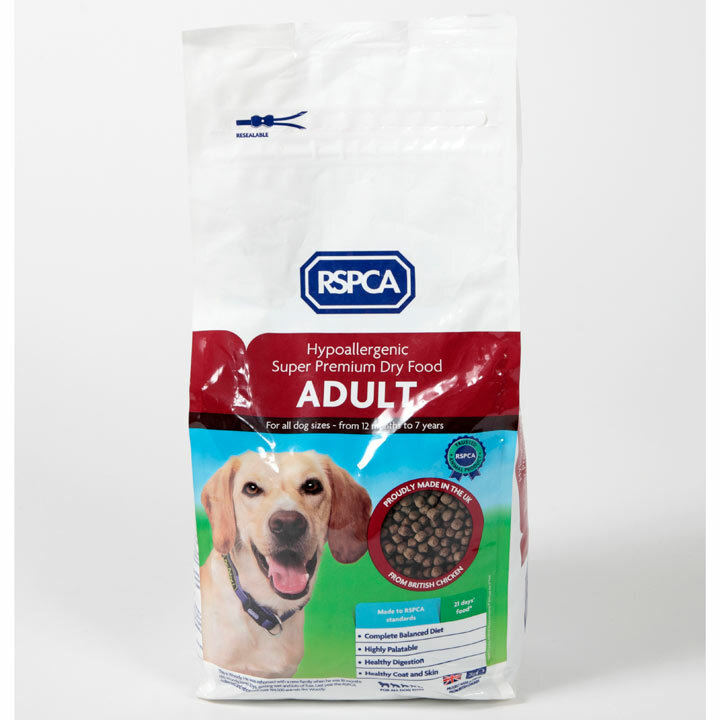 Our Adult and Senior | Light recipes also contain yucca schidigera extract which may help to reduce faecal odour. Vitality: Our Adult and Senior | Light recipes contains rice, a source of carbohydrate for sustained energy release.